When people set out to lose weight, they’re typically looking to lose fat. In reality, as the number on the scale goes down, it’s not just fat that’s being burned; you’re also losing water weight and sometimes even some muscle mass. In fact, the number on the scale doesn’t tell the whole story as explained by personal trainer Max Weber, NASM, ACE, on Instagram. As Max showed, weight loss often fluctuates; the number on the scale could be different day-to-day or even hourly. Losing body fat, on the other hand, is typically more linear. “As weight loss progress fluctuates up and down quite a bit, fat loss progress is smooth and straight because our body fat percentage or lean mass does not fluctuate in the instance where we drink a glass of water, or eat a big meal and then step on the scale – only our bodyweight does this,” Max wrote in his Instagram caption. Instead of relying on the scale to track progress, he recommends taking body measurements, progress pictures, and monitoring how your clothes fit and your performance in the gym. “As you make progress on your bodyweight and body fat and body composition goals, don’t rely on one variable as progress! Focus on multiple variables, because things like bodyweight are fluctuating all the time!” he wrote. So while you’re losing weight, don’t just rely on the scale. 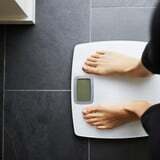 Even if the number on the scale goes up, don’t let it discourage you; it could be water weight or muscle gain. Keep moving ahead on your journey and you’ll hit your goals in no time!